Judge Robin Ransom poses for a portrait at the Civil Courts Building in St. Louis. Starting in January, African-American women will lead two of the busiest courthouses in Missouri for the first time in history. Judge Gloria Reno was elected the presiding judge of the 21st Circuit in St. Louis County in October and began serving that month, because her predecessor had retired. Judge Robin Ransom will become presiding judge of the 22nd Circuit, which hears cases in St. Louis, in January. Presiding judges handle some administrative work for the courts, such as deciding which judges will handle what types of cases. As presiding judge in the city, Ransom handles most preliminary matters, like motions to dismiss. The two women were elected to the presiding judge post by their fellow judges — something Ransom called an honor and privilege. “These are people that you work with and you respect, but you don’t understand the level of confidence that people really have in you until your own colleagues support you for a position of this nature,” she said. Reno and Ransom took different paths to the bench. Reno was in private practice, including a stint as a municipal prosecutor, until Democratic Gov. 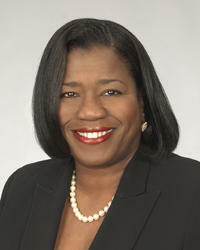 Bob Holden named her an associate circuit judge in 2002. Gov. Jay Nixon, also a Democrat, elevated her to the circuit judge position in 2009. Ransom started out as an assistant public defender in St. Louis County, then switched sides and worked briefly for St. Louis County Prosecutor Bob McCulloch before joining St. Louis County’s family court in 1996. Holden appointed her to be a family court commissioner in St. Louis in 2002, before Republican Gov. Matt Blunt named her a circuit judge in 2008. Judge Gloria Reno took office as St. Louis County's first black presiding judge in October. Ransom and Reno’s elections, along with Wesley Bell’s win in the Democratic primary for St. Louis County prosecutor, mean that starting in January, the top judges and the prosecutors in St. Louis and St. Louis County will all be black. (Kim Gardner, the circuit attorney in St. Louis, was elected in 2016.) Both judges hope that will allow people who distrust the system a space to be heard. Both women say they want to use their positions as the public face of the courts to encourage jury service. Both will also push for the expansion of diversion programs like mental health or drug courts, which allow defendants facing low-level charges to go through intensive treatment in exchange for having the charges dropped. Reno, as presiding judge in St. Louis County, also has oversight authority of the county’s 82 municipal courts, which handle minor ordinance violations. Many are facing lawsuits for violating the rights of defendants. Reform is a work in progress, she said. Reno says she hopes to have all 82 municipal courts online by the end of her first year as presiding judge. “If we are really making real progress in that, I think I’ll consider that to be a positive, for sure,” she said. Ransom said she wants to spend her first year getting 15- to 25-year-olds excited about “the court system, the judiciary, their city where they live. Presiding judge terms generally last for two years, but Ransom may leave before her term is complete: She is one of three finalists for a seat on the Missouri Court of Appeals. A conversation with judges Robin Ransom and Gloria Reno.